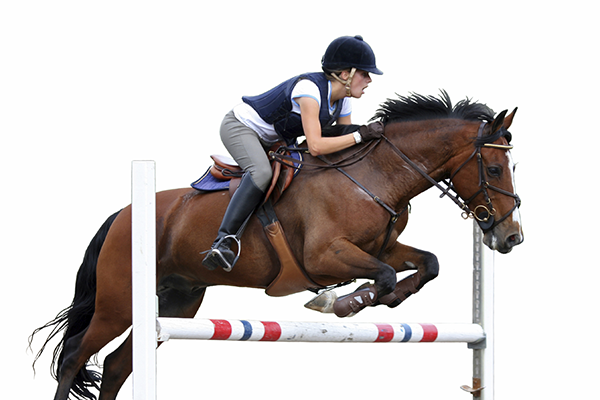 Events such as racing, show jumping and cross-country riding present obvious hazards, but falls and kicks are likely to occur in all equestrian pursuits. Statistics show that many accidents occur during seemingly more sedentary exercises, such as general leisure riding (hacking) on the road. Although head injuries are generally by far the most serious, upper torso injuries can also be potentially life-threatening. Equestrian protection has been available for a number of years and in various forms – such as helmets and body protectors offering protection against impacts. They have developed over the years from hard and stiff foam protectors with limited flexibility to softer, more comfortable garments allowing greater movement, which still provide at least the same level of protection. There are many standards that are used throughout the world for testing equestrian body protectors, but the safety standard for testing and certification of such products to be used in the European market place is EN 13158. Notification was received at the start of this year to confirm that EN 13158:2009 had been revised and that the new version of this standard (EN 13158:2018) was to supersede EN 13158:2009. This document has been amended to include changes to existing requirements, such as protective coverage, exceptions to the dimensions that permit specified areas of reduced thickness foam, the amount of testing required and the inclusion of requirements specifically for drivers and passengers of horse-drawn carriages. In addition to claiming that their products meet the requirements of EN 13158, many companies also claim compliance with the British Equestrian Trade Association (BETA) standard. This standard is a UK certification scheme operated by BETA. Testing is based on EN 13158, but the scheme involves additional annual re-tests on the certified protector by a BETA-approved laboratory such as SATRA. Following notification that EN 13158 has been revised, BETA has also announced that its current standard (BETA:2009) will be superseded by BETA:2018, which will be based on EN 13158:2018. As with EN 13158:2009, the latest version of this standard (EN 13158: 2018) continues to detail requirements that provide a realistic level of protection within the ergonomic restraints of horse riding. It covers products supplied for general riding use (as well as more specialised sport such as racing), people handling horses and carriage drivers. However, EN 13158:2018 also recognises the need for body protectors to be as comfortable as possible and provide the wearer with the ability to carry out normal movements associated with equestrian activities, while still maintaining an adequate level of protection. Although retailers will see little or no change to the finished garments, from a manufacturing and testing perspective there have been some small changes to EN 13158 of which manufacturers should be aware. While the majority of the testing requirements remain the same (including the levels of impact protection offered by equestrian body protectors), there has been a slight increase in the size of the armhole that is permitted. This has been introduced in order to enable better fitting garments, which will be particularly significant for eventing riders and professional jockeys. In addition, there have also been some minor changes to the wording of some clauses, to include further clarification to assist manufacturers in clearly identify testing requirements and to better understand how the products are assessed. Testing of equestrian body protectors includes impact testing at ambient temperatures. An optional 30°C impact test is also available, as are tests of the garment for protective coverage, ergonomics and restraint properties (to ensure that the protector remains in place when a force is applied to the garment). Protectors tested against this standard can be assessed as ‘Impact Level 1’, ‘Level 2’, or ‘Level 3’ garments. While levels 2 and 3 are considered suitable for general riding use, level 1 garments are only suitable for professional jockey use. One of the most important properties of this type of protector, along with protective coverage, is the ability to withstand impact. 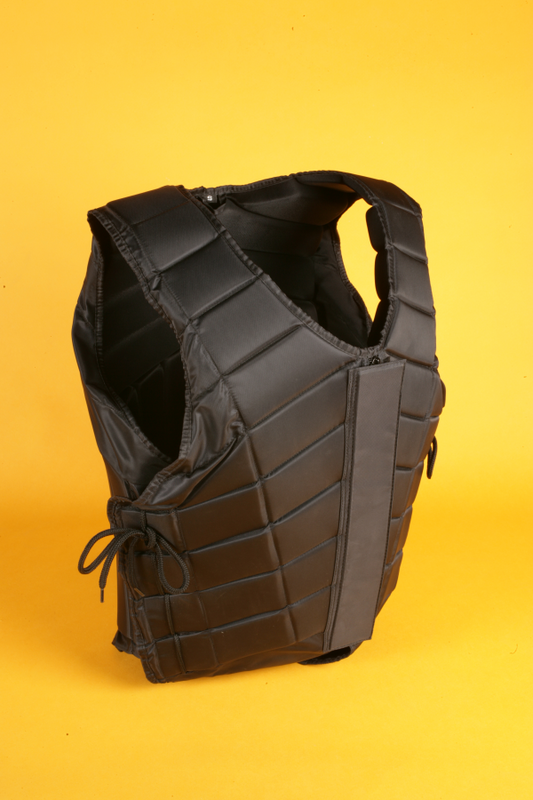 The impact testing methods and requirements in EN 13158:2018 remains the same, and impact testing must be carried out on whole body protectors, while also making specific reference to the requirement of testing ‘weak points’ such as zip closures and hinged points during the impact assessment. EN 13158:2018 only requires testing of protective coverage on at least seven sizes from the given size range where this many sizes are available. However, if one of these given sizes fails to meet the requirements, the standard states that full testing of the dimensions will be required on all sizes available within the given size range. As with EN 13158:2009, this latest version of the standard still does not permit detachable tail components to be included in the calculation of the minimum protective coverage of the garment. Detachable tails are only permitted if they fully comply with all other requirements and are in excess of the minimum amount of protective coverage. The latest version of this standard still permits areas of reduced thickness foam at both the shoulders and sides to enable adjustment. There is, however, a requirement that there be a minimum 25mm overlap of full thickness foam in these areas. EN 13158:2018 requires protectors to incorporate a contrasting colour warning marker at least 10mm wide to indicate when the widest permitted setting of the adjusters has been exceeded. However, this particular system is not required if adjusters cannot physically be opened further than the permitted maximum, and also if this restriction cannot be over-ridden by the user. In common with many other European standards, EN 13158:2018 requires manufacturers to supply safety data as part of the compliance process. The data to be examined is specified in the standard and will need to be checked by the test house. Although it appears onerous, the manufacturer has previously been obliged to confirm this as part of the EU type examination process. It is recommended that manufacturers obtain safety data sheets from material suppliers and keep certificates of conformity supplied with each batch. The standard does not introduce anything that is not already covered by EU legislation. SATRA is able to test all aspects of EN 13158 and carry out EU type-examination for CE marking against the PPE Regulation 2016/425. SATRA is also a British Equestrian Trade Association (BETA) approved test house for their BETA body protector scheme. SATRA has a wide range of specialist testing equipment to carry out testing of various products offering equestrian protection. Furthermore, SATRA is a Notified Body, and is able to carry out both testing and certification of such products in accordance with the PPE Regulation. Please email ppe@satra.com for further information.